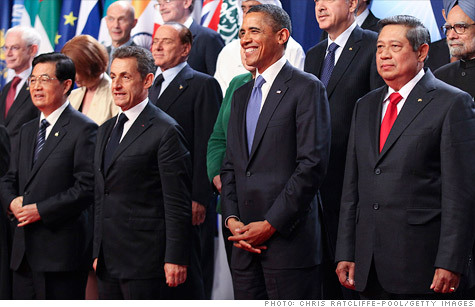 World's top economic leaders stand together for a 'family portrait' at the G20 summit in Cannes. CANNES, France (CNNMoney) -- After a summit dominated by concerns about Europe, the world's most powerful political leaders produced a two-page "action plan" for the global economy that builds largely on existing policies previously stated goals. The Group of 20 Summit in Cannes, France, ended on a rainy Friday with broad promises from leaders to work together on economic challenges that must be addressed in different ways by different countries. In their official communiqué, the G20 leaders welcomed the plan European leaders agreed on last month to address the debt crisis in the eurozone. They also praised Italy for agreeing to have the International Monetary Fund oversee the nation's progress on fiscal reforms. But the official statement made only passing mention of Greece, which has dominated behind-the-scenes talks here over the last few days. Greece caused a stir before the summit even started by announcing a controversial referendum, only to reverse course a few days later. The government of Prime Minister George Papandreou faces a confidence vote Friday. President Obama acknowledged the political drama in Greece, but sounded optimistic about the ability of European leaders to get the crisis under control. "I think that there are going to be some ups and downs along the way," he said. "But I am confident that the key players in Europe -- the European political leadership -- understand how much of a stake they have in making sure this crisis is resolved." Italy has also been the source of much hand-wringing here. The nation has seen its borrowing costs rise to unaffordable levels recently amid concerns in the global financial markets about the government's ability to get out of debt. The G20 urged "rapid elaboration and implementation" of the so-called comprehensive plan to address the debt and banking crisis threatening the euro currency and global economy. "We welcome the euro area's determination to bring its full resources and entire institutional capacity to bear in restoring confidence and financial stability, and in ensuring the proper functioning of money and financial markets," the communiqué states. European leaders were expected to unveil details of the plan, agreed to after an all-night meeting that ended Oct. 27, at this week's summit. But key aspects of the agreement remain unresolved and there are concerns about policymakers' ability to follow through. The G20 also pledged to ensure that the IMF has sufficient resources to support economies that get into financial trouble. U.S. officials have repeatedly said that the IMF has sufficient resources to achieve its objectives. But the increasing threat of a government default in Europe has raised calls to beef up its capacity. The leaders tasked their finance ministers to explore "various options" to increase the fund's flexibility, including bilateral contributions, the use of Special Drawing Rights -- a currency like instrument administered by the IMF -- and creation of a trust fund for voluntary contributions. Meanwhile, the action plan is made up of broad policy prescriptions for the global economy, many of which have already been discussed by G20 members. It starts with Europe implementing the Oct. 27 plan, including debt relief for Greece, new capital requirements for banks and a stronger "firewall" to protect vulnerable euro area economies. 0:00 / 2:20 Should China bail out Europe? To ensure a "balanced" global recovery, the G20 called for advanced economies to continue with "appropriate" fiscal consolidation programs. The United States agreed to support its economy through government investments, tax reforms and job creation programs. At the same time, the U.S. government will continue to take steps to cut deficits and reduce debt under its "medium term fiscal consolidation" program. G20 nations that have large budget surpluses, such as China, "will take steps to support domestic demand," according to the action plan. China also agreed to move towards "gradual convertibility" of its currency, the yuan, and will slow the rate at which it accumulates reserves.